PomoNews.com: THE NOBEL PEACE PRIZE GOES TO..ARAB SPRING! THE NOBEL PEACE PRIZE GOES TO..ARAB SPRING! In the Arab Spring (not a grassroots movement) the rule of the Muslim Brotherhood was advanced with the support of the West. But tyranny by popular proclamation isn't Liberty, or even democracy. Geo politically the policy has destabilized the entire Middle East and North Africa. Sep 1, 2015 In the Arab Spring, Tunisians hoped that jobs and prosperity would follow the rise of democracy in their country. Now, Tunisia is the number 1 supplier of rats for the Islamic State. UPDATE: The progressive supranationalists of Nobel Committee striking again! The Economist has the gall to call the Arab Spring disaster in Tunisia "a rare success". A country that, like Egypt, managed to save itself from the onslaught of democratic Islamism in the nick of time! As we read in this log, Tunisia is the number 1 supplier of ISIS rats! The Nobel Peace Prize ought to be renamed the Orwell Peace Prize! This video explains why Liberty is so terribly fragile and extremely hard to get. Tunisians hoped that going to a ballot box would "create jobs". This is what they were let to believe. It's ridiculous! Only economic ignoramuses can come to such a statement. The tribal mind is locked in a vicious cycle: tyranny breeds the need for more tyranny. The cycle can only be broken when a large chunk of the population discovers his individuality and starts finding personal values. As long as the people see (collectivist) ideologies as the solution, there will not be freedom and prosperity but more unemployment and poverty, disenchanted young people, and waves of former protesters joining yet another form of tyranny. Obama has consistently supported oppressive Islamic regimes, while throwing liberation movements under the bus: from Iran's Green Movement to Turkey's Kemalists. 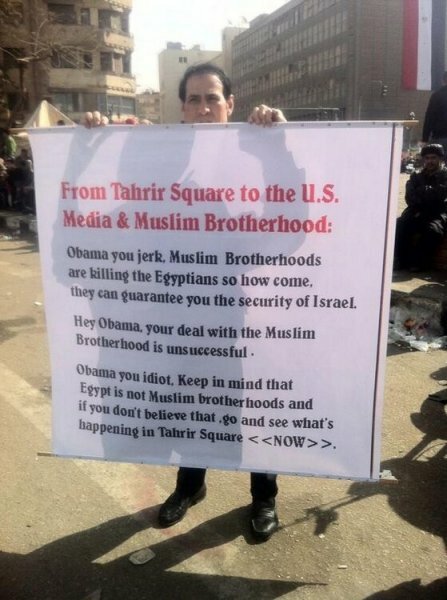 "MB infiltrated Obama govt." NOTE: This blog is primarily about the Arab Spring and how it played out in the Middle East. News related to the Muslim Brotherhood particularly is available on this live blog. What did McCain do and say in Egypt to earn the ire of millions of Egyptians? First, most offensive to Egyptians—and helpful to the Brotherhood's cause—is McCain's insistence on calling the June 30 Revolution a "military coup." (...) Further angering Egyptians is McCain's insistence that all arrested Brotherhood members be released from prison. (...) McCain's call to release Brotherhood leadership validates the widespread belief in Egypt that America is a fellow conspirator with the Brotherhood. (...) McCain also personally visited Khairat al-Shater, the multi-millionaire deputy chief of the Brotherhood who is currently incarcerated on charges of treason and terrorism. Interestingly, Shatter was not even a member of Morsi's government. Why is McCain visiting a civilian? Shater's status as a major figure in the largest Islamist organization in the world is leading Egyptians to connect the dots. Brilliant! Senators John McCain and Lindsey Graham did their best to prop up the Muslim Brotherhood and attack political leaders during their short visit to Cairo. In response, military leaders lashed out at McCain for interfering with the country’s internal conflict. McCain and Graham also said the country was near “all-out bloodshed.” The two US senators exacerbated anti-US feelings in the country. Nice work, guys. Egypt’s military-backed government on Tuesday harshly rejected statements by visiting U.S. Sens. John McCain and Lindsey Graham, who called the military’s month-old takeover of power as a “coup.” McCain (R-Ariz.) and Graham (R-S.C.) had used the word “coup” at an afternoon press conference to describe the manner in which Egypt’s military had seized power from the Muslim Brotherhood’s elected president, Mohamed Morsi, in early July. (...) A spokesman for the interim government, Sherief Shawki, immediately dismissed the characterization. Shawki also said the involvement of McCain and Graham was unwelcome, adding, “We don’t want foreign intervention to be imposed on us.” In a statement later on Tuesday, distributed by Egypt’s Middle East News Agency and reported by Al Jazeera’s Rawya Rageh, a top media advisor to Egypt’s interim president, Adly Mansour, offered a stronger rebuke. The statement accused McCain of twisting facts, and dismissed his remarks as “clumsy,” or “irresponsible,” depending on the translation. Increasingly the Western establishment, including politicians, media and NGOs are shifting from a wait-and-see attitude to open alignment with the ousted Islamist president. The EU's Foreign Policy Czar, former communist Baroness Ashton has had a two hour midnight meeting with ousted Muslim Brother Morsi at an undisclosed location. Prosecutors formally remanded Morsi into custody on Friday for 15 days, charging him with murder and espionage. Ashton's meeting comes amid rising expressions of concern from lawyers, human-rights activists and foreign diplomats for information on Morsi's location and welfare. Some human-rights researchers said the charges suggested a politically motivated attack. Some reports have Ashton saying that Morsi has access to TV and news papers. French Foreign Minister Laurent Fabius said on Tuesday that Egypt's deposed leader, Mohamed Mursi, should be released, calling the country's political situation "very critical." "France calls for the rejection of violence and for the release of political prisoners, including former president Mursi," Fabius told journalists in Paris. Erdogan is showing himself the Muslim Brotherhood dictator that he is. The world is waking up to the fact that Islamists and democracy are inherent contradictions. Arab Spring was a lie that had to collapse in the face of reality. After Turkey and Egypt, now Tunisia, Libya and Syria are rejecting their rule. As we see what Erdogan is doing to the foreign press, watch what he's capable of with the media at home! The Saudis had given secret assurance to Defense Minister and Chief of the Army, General Abdul Fattah al-Sisi, that the Saudis along with other conservative Gulf oil states including Kuwait and UAE would guarantee financial support should the Obama Administration cut the €1 billion annual aid to Egypt’s military in retaliation for ousting their man, Morsi. Fmr UK Ambassador: "Obama's Cairo Speech Was Omen"
Former UK Ambassador Charles Crawford @CharlesCrawford says Obama's Cairo speech set the stage for the disaster in Egypt. As a former Ambassador myself, I can tell you that once a vast unhappy crowd starts carrying pictures of your country’s ambassador and calls for her/him to pack up and go home, things have gone badly wrong in the bilateral relationship. Thus with U.S. Ambassador Anne Patterson in Cairo. She is seen by large parts of Egyptian society as a symbol of incompetent U.S. meddling. She is denounced for getting too ‘involved’ in Egyptians’ affairs or for backing the wrong side, or both. How did U.S. diplomacy in the Middle East reach this sorry pass? I can’t help feeling that the famous speech delivered by President Obama in Cairo in June 2009 gives us some clues. In his article, Mahmoud Salem @Sandmonkey is setting the record straight "regarding the legitimacy issue" brought by the Muslim Brotherhood and its supporters. In other words, if the process by which a 'legit' government came to power was fatally flawed, is its ouster by the military still to be considered a coup? In these pages we have argued that Morsi's regime was illegitimate because every Sharia based government is, since it violates individual rights. U.S. law states that we can’t send military and other types of aid to any country whose duly elected head of state is deposed by a coup. U.S. law clearly says that we cannot send such aid where the military plays a decisive role in the coup. This law allows no presidential waiver. Aid cannot be reconsidered or restored until a democratically elected government is elected. Yet, as President Obama has so often done with other laws and even the Constitution, he ignores it. The Obama administration has refused to acknowledge that the military takeover in Egypt is a coup. When asked directly to spell out the State Department’s definition of a coup, spokeswoman Jen Psaki refused, saying only that, “I’m happy to get you that, but I wouldn’t ascribe, you know, specific words. Each scenario is different. And if you need our specific, formal, government definition, we’ll get that around to everybody.” The State Department has yet to send a response. Egypt's Daily News has an excellent piece by Farid Zahran why the US is supporting the Muslim Brotherhood, and explains why it is a grave mistake. 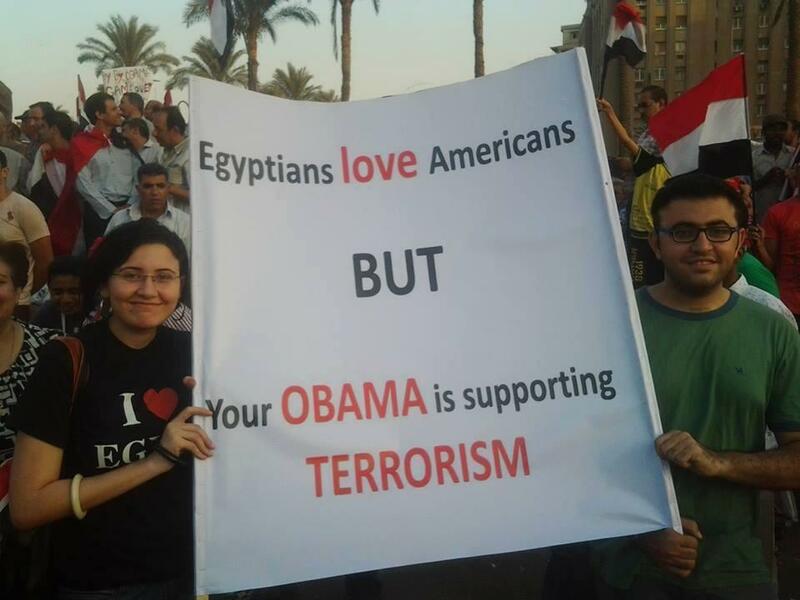 Does the United States not know what’s happening in Egypt? "After Morsi, They Hate Obama Most"
"Try Replacing the Cabinet, Oust the Prosecutor"
The New York Times is spinning with all the might it can muster! 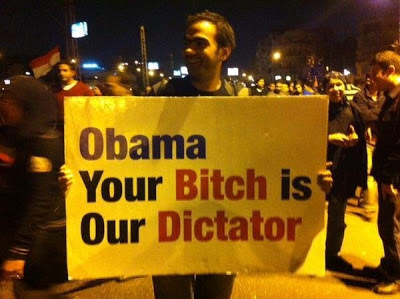 "Arab Spring Was a CIA and NED Operation"
Another pretty picture has surfaced from Egypt! Banner in Tahrir Square on June 29, 2013 on the eve of the Second Egyptian Revolution. A Hamas leader claims the terrorist group has had "direct meetings" with U.S. officials close to the White House despite a longstanding American policy to have no contact with Hamas. The claim from Hamas leader Ghazi Hamad was reported in a Palestinian news outlet. Top American representatives were in meetings Hamas had with European ambassadors and officials about two weeks ago, he said. The officials discussed removing Hamas from the list of designated terrorist organizations, but that "these contacts have not yet reached the level of decision-makers," Hamad said in a Sky News Arabia report translated by the Investigative Project on Terrorism. After Morsi, the second biggest target during the Second Egyptian Revolution is US Ambassador Anne Patterson. 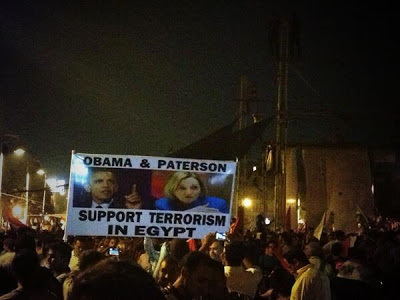 Patterson met in secret with some Muslim Brotherhood people. She is her master's voice. 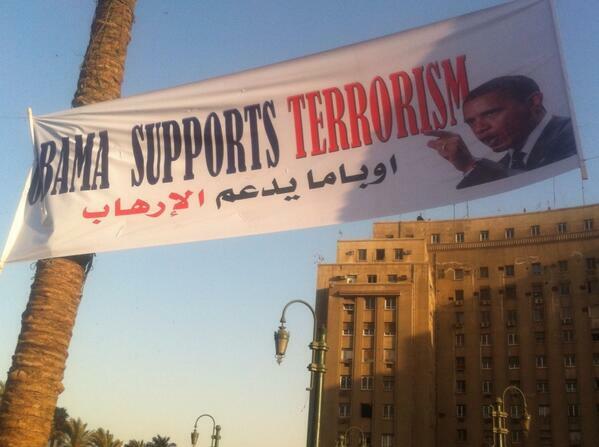 Obama supports the Morsi regime. This file is related to the larger process of "Arab Spring", a series of revolutions which broke out in 2011 in Tunisia and Egypt, which deposed secular dictators and replaced them with theocratic tyrannies under the rule of the Muslim Brotherhood. These coups were 'legitimized' by democratic elections. Democracy however, is not an end in itself; rights are (article). Democrats fail to understand that distinction. Theocracies can only exist in violation of individual rights. Therefore they are illegitimate by definition. In Libya the dictator Ghadaffi was deposed by a NATO intervention that led to regime change. Syria is still a work in progress. We contend that the entire operation is part of a man-made plan hatched in the Obama regime to bring the Muslim Brotherhood to power. It is also supported by Qatar, Hamas and Turkey. The nefarious ultra Brotherhood has since been recast as 'secular' and 'moderate' (in comparison to the Salafi factions, supported by the United Emirates and the Saudis, that is). With the revolution enjoying a second chance in Egypt, and the Kemalists in Turkey trying to prevent that country from sliding into a Neo Ottoman Empire under Erdogan and the AK Party (also a Muslim Brotherhood brand, as is Hamas in Gaza) there is finally some meaningful push back from this process.